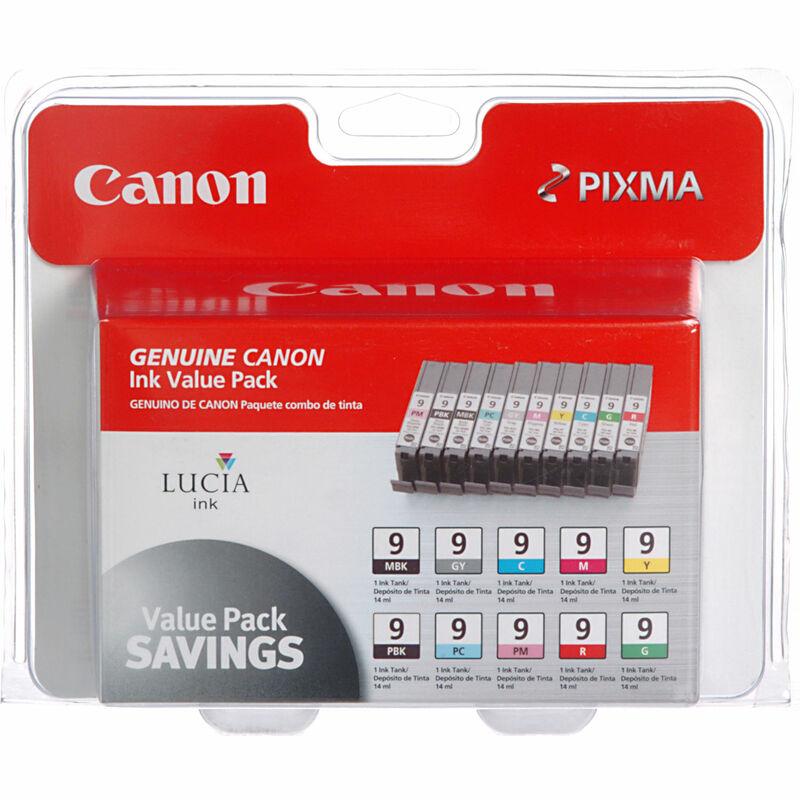 Box Dimensions (LxWxH) 6.6 x 5.65 x 2.85"
LUCIA PGI-9 Ink Cartridge 10-Pack is rated 4.7 out of 5 by 159. Rated 5 out of 5 by Alice from great prints ---but but the price point is a bit high. As a new user of this product I can only say the prints I have produced with this ink are excellent, and of gallery quality. And that's where I hang them. I use my Canon printers as workhorses and run through ink quickly. Can I afford to run 50 copies (for those who don't have computers) of an 8 (11x17) page newsletter at these prices. I do that 12 times a year on the i9900. No, I probably can not. So, I'll have to keep my i9900, with its more reasonable ink costs instead of handing the printer off to an emerging artist who could make use of it. I will look forward to reporting further on this product. Rated 5 out of 5 by R. Wilson from Great ink, convenient features I use this ink for all of my printing (on a PixmaPro 9500 mkII) and love it. A key feature that steered me toward that printer, and hence the PGI inks, is that the 'photo' and 'matte' blacks are both permanently installed, so there's no switching between the two. Also, when a cartridge is empty, your print driver will tell you which cartridge to replace, AND a little light will blink on the cartridge itself, to prevent any possible mistake. This ink seems to work as well on the 3rd party papers I've used, as well as the Canon papers. I've had nothing but good reviews from friends and collegues on the quality of the prints. Good stuff. Rated 5 out of 5 by Elaine C. from Great Color Inks!!!!!!! I have used Cannon products for years. I have always used Canon Printers and liked the individual inks concept developed by Canon,this is why I hesitated in purchasing Epson Printers. The Canon Pigment Inks are much brighter than the Epson Pigment Inks. I researched this for several months before buying the Canon Pro 9500. I have a Canon I9900 that use the dye ink and have never been disappointed. When I first used the Pro 9500 I was blown away by the color accuracy and with the 2 blacks and 1 grey inks gives such a tonal quality that black and white photographs deserves. I have never been disappointed with Canon, Pro 9500 is a big winner and more affordable than Epson. Rated 4 out of 5 by Doggy Doug from Great Ink, Small Cartridges I use the ink with the Canon Pro 9500 Mark II printer and mostly Red River Arctic White Gloss, and while there is noticeable silvering visible when the prints are viewed from sharp off-angles, the overall effect is great. Had an HP 8850 printer previously, and these Canon inks and the 9500 Mk II are clearly superior in color saturation and range, with less silvering. Heartily recommend the printer and the inks, as long as you are prepared to stock up on lots of extra cartridges. Blacks and gray seem to go particularly fast.... Can't complain too much about the size of the cartridges, as there have been plenty of previous reviews pointing out this problem. Rated 5 out of 5 by richard p. from Pricey, but worth every penny After using the printer (Canon9500Pro) for a while I started waiting for the ink low warning light. It wasn't til I had made a considerable number of large prints that I finally had to change out the gray cartridge. Then after many more prints, I finally had to change two of the color cartridges. The mileage I am getting from this printer and cartridge set is impressive. It is far better than I had expected. I placed a 4x6 on my car dash, and it has been there for two months and has no fade or color change. This was my test print. Rated 5 out of 5 by Bill a Canon Beliver from Great ink replacements I've used Canon brand products most of my adult life. I find Canon products to be superior to other brands because they simply do not cross the line. Canon specializes in photography and printing products. I've used Canon inks for my 9500 pro printer since the day I bought it. I've had nothing but great results from my print jobs. I print mostly using 13x19 paper, so you can imagine how easy it would be to spot discrepancies. I am not an avid photographer, nor do I print a lot, so as you may have figured out, I am very particular about what I print and how well the prints I produce. Rated 5 out of 5 by Bonnie from wonderful results! I use this ink in my Canon Pixma 9500 Photo printer and the results that I get are great! I was pleased with how easy it was to replace the ink tanks: no different from the other Canon printer that I own for mostly documents. The ink dries faster than Canon recommends waiting after printing the picture. In the future I will always buy the multi-pack ink since I only bought what I needed only to find that the other tanks were also low but did not show up as such until after I had sent away ...for 2 ink colors. The ink is great but it is costly to have to replace them all at once. Rated 5 out of 5 by Anonymous from Economical & Convienient! We find buying the PGI-9 Ink Cartridge Kit plus buying a few of the most used cartridges a great way to have a full set of cartridges availabe for our Pixma 9500 printer.